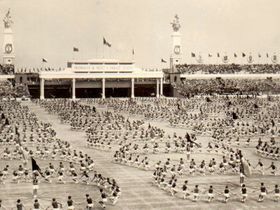 Spartakiads, or Spartakiady, mass gymnastic exercises, were a unique event of their kind in Czechoslovakia under the Communist regime. 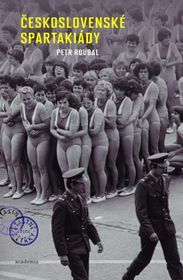 Historian Petr Roubal has put the phenomenon under the spotlight and the result is an award winning book looking at the various events and how they evolved over time. I asked him how much did the first Spartakiad in 1955 differ the similar mass events or Slets, organised previously by the Czech Sokol movement. Petr Roubal, photo: Czech Television ʺIt is a really interesting question, one that really surprised me when I started to research it, how dependant they were on the Sokol tradition, of the Sokol Slets, that means this mass gathering of the gymnasts. In fact it is a nearly perfect copy of that example. So, basically the first performances of that style comes from the 1860s, the sort of style of synchronized movement of male gymnasts with very simple drumbeats or simple musical accompaniment. Also, the movements are very simple, they resemble very strongly military drill. 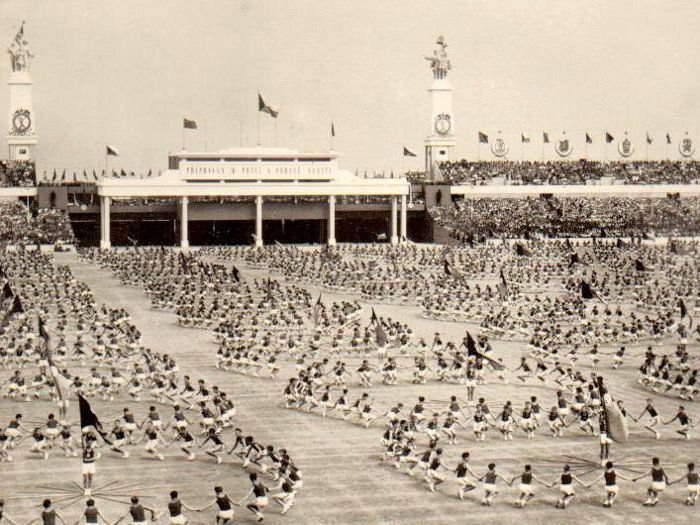 The main activity were these performances which became really massive shortly before the First World War, when we are already speaking of dozens of thousands of gymnasts performing at the same time. And then it became even bigger during the inter-war republic. The most famous of these gathering is the 1938 Sokol gathering which had huge international audience. It was also a very clear standpoint against the Nazis because it was in late June 1938 at a time of mobilisation and pressure from Nazi Germany. ʺAnd then again in 1948, after the Communists had already taken over power, there was another Sokol gathering with Klement Gottwald already the president. There was a lot of tension there. But the 1955 Spartakiad really used this tradition very effectively. It used the organisational skills of the Sokols – they were practically the same people as they were in the previous slets – and the participants were the Sokols themselves. The composers were the same and the choreography was done by the same people. ʺThey spoke about this artificial Soviet influence." ʺBut at the same time again there were Soviet influences. One thing we don’t find in later Spartakiads is the involvement of the avant-garde artists from the inter-war period. So there was this attempt to give it the flavour of mass theatre which was very popular in avant-garde theatrical circles. Also the colour compositions were very much under the Soviet influences, which was later on criticized by the Sokols which were shocked by some of the colours, for example, soldiers performing in pink. They spoke about this artificial Soviet influence, of course, only in internal discussions which were not intended for the broader public. This was seen as something outside the national tradition and was later removed from the Spartakiad. ʺOf course, the symbolism of the 1955 Spartakiad was very explicitly political. People formed five pointed stars with their bodies in the stadium. They wrote slogans with their bodies and so on. 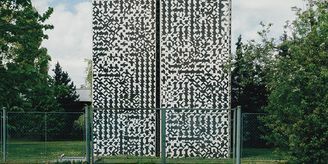 It was explicit symbolism, but you can find that in Sokol slets as well so it is not something that is completely new." ʺYes, absolutely. This was a very different event. First of all it was around half the size of the previous event. But it also echoes the culture of the 1960s. You have a much more relaxed atmosphere there and the performances and the choreography try to find some common ground with the spectators and the participants, especially the young ones. There was the Cha-Cha performance of the teenage boys and girls who performed this dance in the Strahov stadium in swimsuits. Especially with the overgrown teenage boys, this looks somewhat weird. But it was an attempt to give it a more human dimension. Also, one change, which became very apparent later but is already visible now, is the change in the perception of the human body. In 1955-1960, it was a more explicit political symbol that these bodies were creating symbols and letters and so on. They wore uniforms and carried weapons and agricultural tools. Also the movements were symbolic, emphasizing something else…"
What surprised me was that in 1970, when there should have been the next Spartakiad, there was not one. It was cancelled and the reason for that was that the Communist authorities were not sure if they could adequately control what sort of show would be put on. This was quite surprising, no? 1955 Spartakiad, photo: Czech Television ʺYes and no. One of the claims of my book is that we deal with a real authentic ritual in a sense that it was such a huge event that it needed to involve lots of people who were not committed to Communist ideology and policies and that it had some sort of dynamics of its own. 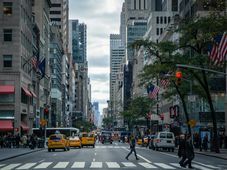 Quite naturally, in a situation where the Communist Party did not control society, that dynamic could have turned out to be dangerous for the system itself. The Communist Party had after all witnessed that already once already in 1948 when during the Sokol march through Prague it turned into an anti-Communist protest. So, I think they were quite right to worry how it would develop. Of course, the performances would be designed the way they were supposed to be. What was really threatening for them was the concentration of young people in Prague, moving without any clear organisation, and the sort of self organisation of the masses was definitely something they could not afford. 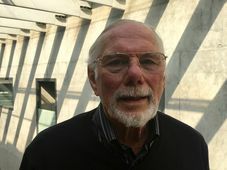 The decision to cancel the 1970 Spartakiad in Prague came in quite a direct response to the protest in commemoration of the first anniversary of the Soviet invasion in August 1969 when the Communist regime saw that people were still willing to risk their health and life protesting in Prague and other cities." But they decided later to renew the Spartakiad but under the so-called Normalisation. What did the Spartakiad look like under Normalisation? ʺIn terms of scale nothing like that was done anywhere else." "They inherited this view of the body as inherently beautiful and strong and so on and used this natural power of its symbolism. That is the progressive part. 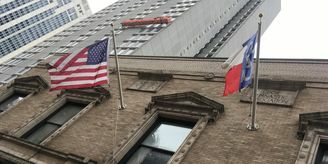 At the same time, they took from the Sokol tradition this stress on rather conservative values, especially family values. Any sort of dynamism is lost from that. Also, the three Normalisation Spartakiads look very similar to each other,. Even as an expert, I have difficulty to recognise the pictures from the Spartakiads because they really look identical and there are few clues to guide yourself. More generally, how unique were the Czechoslovak Spartakiads in the form that they were as a massive public show and participatory event? ʺThey were unique in many senses. First of all they were organised for the biggest stadium in the world so in terms of scale nothing like that was done anywhere else. They were also unique in that they were a follow up on the Sokol traditions. 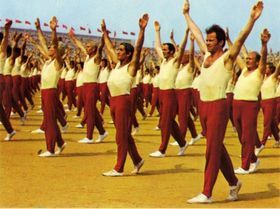 This genre of synchronised exercises is not particular to Czechs, it was also popular in the Soviet Union as well and other socialist countries. But it was always as an introduction or conclusion as the opening or closing ceremony to something else, usually some sort of competitive sport or political ritual. But here the synchronized movement is the event itself. For several hours people watch how other people move in synchronized fashion. That actually was not done in the Soviet Union. 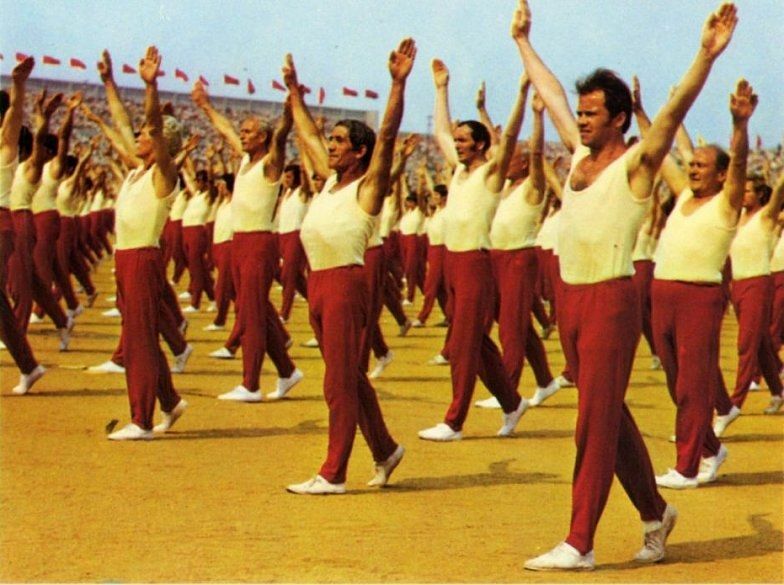 It was usually quite a short performance of synchronised movement as the opening to something else, such as the opening of the Moscow Olympics in 1980 has this performance but only as a prelude to something else. " How much was there real enthusiasm for these events and how much were people forced or pushed to take part, is it possible to say? Photo: archive of Czech Radio "It is a tough question. This is an event which involved millions of people, so of course I tried to find an answer to that but it is not easy. There is a difference between the first Spartakiad in 1955 and the other ones, In 1955 lots of people were actually forced to participate and we have plenty of evidence for that. It was not so much that it was unpopular as that it was so badly managed and done so quickly that they did not mobilise the right people and then forced people who really did not want to take part. 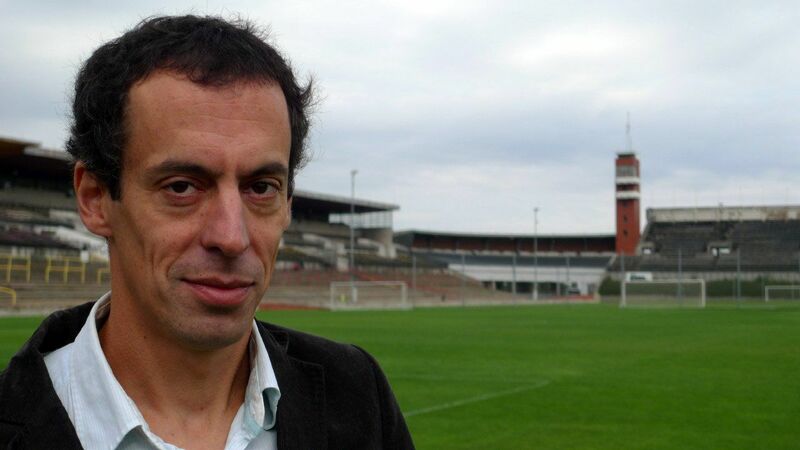 In the Czech Lands you had the sub culture of the Sokol movement and people were enthusiastic to do that but you also have a sporting culture and people who hate this synchronised movement and would prefer to play football and other sports which are completely different in nature. So what happened in 1955 is that these sportsmen, these football players and hockey players and so on, were forced to take part in Spartakiads and the threat was that their clubs would be dissolved, funding would be removed, and so on. So, this quite brutal push on people was there. I read that enthusiasm in Slovakia was not the same as what is now the Czech Republic because it was perceived as something that was more Czech and something that was imposed from Prague? ʺThat is absolutely the case. The Spartakiads are Sokol slets, there is no way around that. 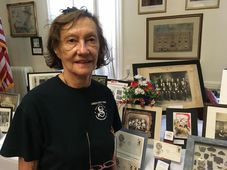 Of course that means that the tradition of Sokols is missing in Slovakia plus, not only is it missing, but it also has completely the wrong association which is of Czechoslovakism, which was not popular in Slovakia."